An Elgin base runner slides safely into the plate before the ball gets to the mitt of Fairbanks catcher Anna Higbee Thursday evening. The Comets downed FHS, 11-3. Fairbanks softball coach Amy Sines was very matter-of-fact when she said what the Lady Panthers would have to do during the 2019 season. The main thing that the veteran coach stressed was the fact that her squad was going to have to play solid defense. That’s because she knew that opposing teams would hit against her young pitching staff. Fairbanks slipped to 4-9 on the season, partially because six fielding miscues gave the Comets additional life on the base paths. Elgin (7-1) scored its first run in the top of the initial inning. Tirah Nelson led off with a single, but was wiped out on the bases when Rachael Schoen was safe on a fielder’s choice. Schoen advanced to second on a wild pitch and scored on a single against FHS starting pitcher Julia Cheney. The visitors from Marion County added two more runs during the second. With one down, Katie Yates singled and raced home on Mikayla Fassier’s double. Fassier advanced to third on the throw from the outfield and later scored on an error. Fairbanks (which will host Greenon today) notched its first run in the home half of the second. Anna Higbee and Gracie Pyers ripped back-to-back one-out singles and advanced on a fielder’s choice. Higbee then scored on a wild pitch from Elgin hurler Ashley Roth. The single by Higbee came after Roth had retired the first four Panther batters in order, all on strikeouts. The Comet sophomore went on to yield only one more hit for the game. Elgin took a 3-1 lead into the fourth inning and added three additional runs. A pair of those scores came when the Lady Panthers committed a trio of errors. FHS threatened in the bottom of the fourth. Allison Kise doubled with one down and went to third on a passed ball. She was, however, gunned down at the plate while trying to score on a ground ball. Roth escaped further trouble with a pair of groundball outs. Fairbanks relief pitcher April Ward kept the Comets off the scoreboard in the visitors’ portion of the fifth. 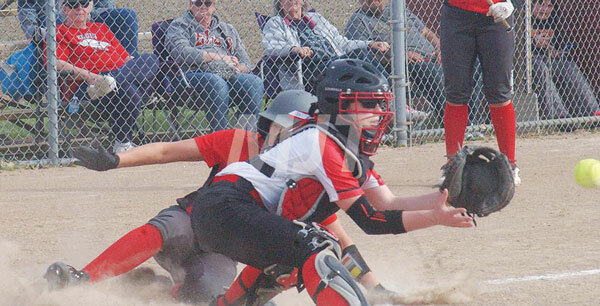 The Lady Panthers narrowed their deficit to 6-3 in the fifth. Mack Greene led off and was hit by a pitch. She was lifted in favor of pinch runner Ashlyn Ward. After a line drive out, Riley Blevins reached base on an Elgin error. Roth got the second out on a strikeout. A strikeout-passed ball sequence left Cierra Madison perched on first and allowed Ward to score a run. Another Comet miscue, this time off Madi Montenaro’s bat, brought in the score that pulled Fairbanks to within a trio of runs. Those were the final runs the Lady Panthers could generate as Roth put them down in order during the sixth and seventh frames. In the meantime, the Lady Comets added three runs in the sixth and two more in the seventh to coast to the victory. Roth scattered three hits, struck out 10 and did not walk a batter. “We ran into a very good pitcher tonight,” said Sines.